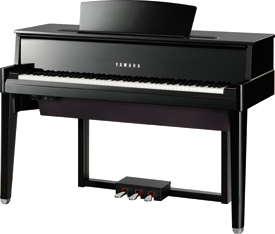 AvantGrand N1, Electric Piano from Yamaha in the AvantGrand series. 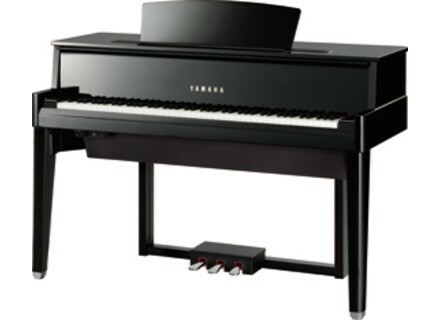 Yamaha introduces the AvantGrand N1, an entry-level version of the company's AvantGrand hybrid piano technology, which delivers the tone and touch of a nine-foot Yamaha CFIIIS concert grand piano in a smaller, more affordable package than the two other models in the series: the N2 upright and the flagship AvantGrand N3 hybrid piano. The AvantGrand N1 offers advanced piano sound reproduction without the tuning, cost or footprint of a comparable stringed instrument, the company says. "With the introduction of the AvantGrand, Yamaha ignited a revolution in the approach to sampling – the recording and playback of the notes of the actual acoustic piano. Treating the soundboard not simply as a point source of sound but as a plane, Yamaha took samples at four positions, adding optimum center and rear locations to the traditional left and right. As a sound source, Yamaha carefully selected the best single instrument from among its CFIIIS full concert grand pianos for sampling. The end result of these efforts is that AvantGrand series instruments recreate the original sound of a superb grand piano almost to perfection. Meanwhile, the instrument's speaker system has been designed to ensure that this sound is heard best at the playing position. A three-way system, featuring woofer, mid-range and tweeter speakers reproduce the rich, natural resonance of the soundboard accurately. What's more, each of the low-, mid-, and high frequency bands has been given its own amplifier to prevent interference between bands. This innovative configuration allows the instrument's outstanding sound system to reproduce the nuances of each individual note." The instrument requires no tuning. In addition to the grand piano sound sample, the N1 also features electronic piano and harpsichord voices. The AvantGrand N1 (MSRP: $9,999) is scheduled to ship in April 2011. For more information, visit www.yamaha.com/press. Korg SV-1 Sound Pack 2 Korg has released the SV-1 Sound Pack 2 for its acclaimed Stage Vintage (SV-1) Piano, featuring an assortment of sounds, including some that were reportedly inspired by user feedback. Roland C-230 Roland introduces a new organ. Roland F-110-SB Roland introduces a new digital piano.